On the first day of the Tet (Lunar New Year) truce, the Viet Cong launch their biggest offensive of the war. One thousand Viet Cong troops infiltrate the city of Saigon. The Communist troops capture the Citadel at Hue and seize part of the US embassy in Saigon. It took nearly two weeks to completely route out the Viet Cong troops. The attack is a military disaster for the Communists: they lose over 10,000 men and do not manage to hold any of their objectives. Nevertheless, the offensive marks a strategic victory for the Viet Cong. For many Americans who had believed the war was being won, the sight of Viet Cong troops holding the U.S. embassy is a rude awakening and forces them to question the U.S. "true" position. After years of the same images of the war, on January 31st a completely different image would fill their screens. While ultimately the communist offensive known as the Tet- offensive would be a military failure, its strategic impact took place in the homes of Americans. The communist had pledged to maintain a ceasefire during Tet- the lunar New Year, but in fact, seventy thousand communist troops attacked 100 cities and bases throughout the country. The war had until now been one fought in the rural areas of the country, now the communist changed the terms of the battle. They attempted to attack the coastal city of Nhatrang, the cities of How An, Danag and Quinhon. They attacked most of the provincial capitals and tried to surge in Mekong Delta. They reserved their largest attacks for Saigon area. They attacked the US Embassy managing to breach it before being killed by Americans on the scene. The communist also captured the radio station and had planned to broadcast that they had captured the city, but the capture automatically cut them off from the broadcast tower. South Vietnamese troops surrounded them and communists eventually blew up the station. 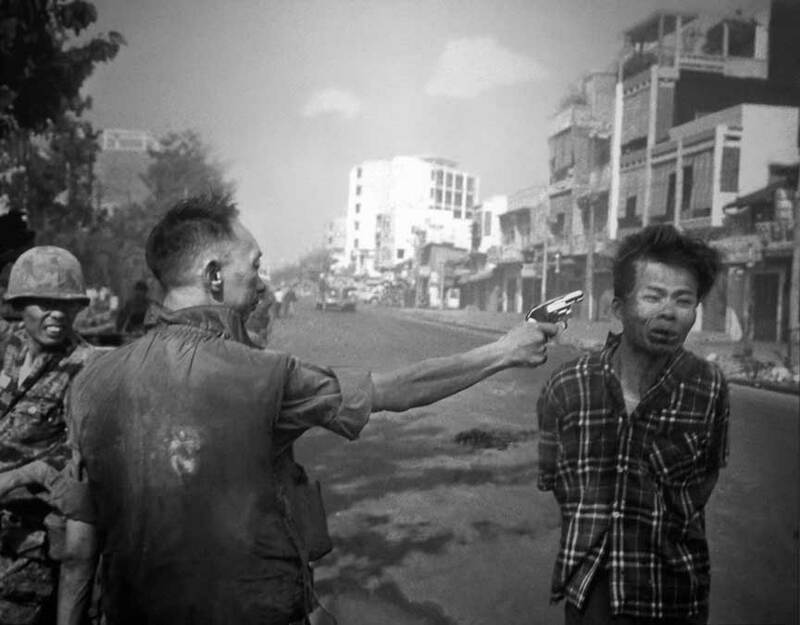 One of the most iconic photos of the war- was taken the next day by Eddie Adams who captured General Nguyen Ngoc Loan shooting a prisoner in the street. The bloodiest battle of the war took place after the communist captured Hue. American and South Vietnamese troops recaptured the city, but not before the communist killed 3,000 South Vietnamese supporters of the regime. When the offensive was over 2,000 Americans, 4,000 South Vietnamese and as many as 50,000 communist lay dead. The biggest impact was back in the United States. There the American people had been told the war was about to be won, the images from the streets of South Vietnam told a very different story.